Fantastic Plastic Toys has revealed a new Masters of the Universe figure coming from Funko. they are releasing a Skeletor Vinyl Invader 11″ Figure. It is scheduled to be released in July or August 2013. Click the thumbnail to check out an image of the figure. Please change his upper arms. They are way too boxy. I think we need to start walking away from the "urban" or "anime" approach to making funky pop collectibles. The face is pretty acceptable. Is this meant to look like a robot? I know a little bit of the old Shogun Warriors and I am seeing some sort of correlation between the two but its not working since old Skelly is flesh and not a shogun robot. 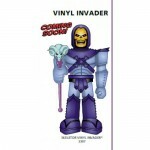 Love the idea of a 11inch Skeletor to rain supreme in eternia. ^ I'm with you. I'm getting tired of all these "designer" style toys that are constantly coming out. They were cool 5 years ago. My problem with most of them, as illustrated perfectly by this Skeletor, is that the design of the body is just ugly. Just for clarification, this is supposed to be a "robot" style vinyl figure. Cobracobra hit it on the head as they are meant to fit in with the Shogun Warriors vinyl figures. I kind of dig it. Probably not enough to buy it immediately. But on sale, I might go for it.